I would expect to see some Republican retirements in the house in the coming weeks, because tonight was an absolutely disastrous night for Republicans. Of my “Fifteen Most Important Races Tonight” Democrats won 13, Republicans won 1, and the final one is headed to a runoff that seems to favor Democrats. Democrats also look poised to tie or take control of the Virginia House of Delegates, which was held by a Republican supermajority, I had rated that as “Likely Republican” the second-safest rating possible, only behind “Safe Republican”. The next time I will join you for election results will probably be in a few weeks (December 12th) for the Alabama US Senate election, assuming the polling is close. The only legislative body on the west coast not controlled by Democrats is the Washington State Senate, and right now, the Democrat Manka Dhingra looks to be poised to take over the 45th district, which would put the Dems over the top. Democrats were never going to lose New Jersey’s state senate, but they do pick up one Republican-held seat, increasing their majority. 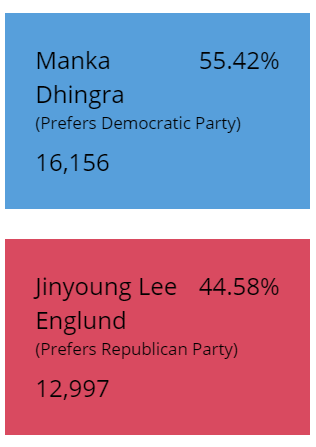 Manka Dhingra is the Democrat running for Washington’s 45th state senate seat, the 45th is a Republican held seat, and a win for Dhingra would mean a Democratic majority in the Washington state house, the only legislative body held by Republicans on the West Coast. While the race will go to a runoff, it’s looking like the Democrats will win that. The “Republican” in the race, Mary Norwood, is 18 points behind the leading Democrat. I can now call Districts 68 and 85 as Democratic pickups. As it stands. The four seats in question are all within 200 votes and will probably be recounted. This didn’t make my list of the 15 most important races of the day, but Democrat Jonathan Wallace beat Tom Lord by over 35 points in what was a Republican held district, an incredible swing. Earlier I called this race as heading to a primary with a probable Democratic pickup, now we can reclassify it to a guaranteed D pickup, as the top two vote getters are both Democrats, meaning that the runoff will be guaranteed to produce a Democratic pickup. Third parties have picked up a significant part of the vote, but while Democrats are going to make some gains in the margins, Utah’s Third congressional district will remain red. This should be a sure thing as Republican’s first win in our list of the 15 major races tonight, but I thought the same thing about the House of Delegates, who knows? Jason Chaffetz won this seat by nearly 50 points a year ago, so even in what has been a wave day for Democrats, this should be an R win. And that is still without New York City in, another, while expected, win for Democratic groups. 8:47 – Maine Medicaid Expansion? Maine’s ballot initiative on medicaid expansion currently leads by seven points over the no votes, I would expect that to tighten as more rural areas come in, no call yet. Democrats have already picked off 12 Republican delegates, they lead in five more, and are down with a chance in about eight after that. A note, they need 17 to take control of the house, I rated that as a safe bet for Republicans to take control of. Ten seats would’ve been a great night, the fact that 25 are still in play is shocking. Democrats lead in 14 (!!!) Republican held state house districts, that outperforms even the most outrageous projections. I can officially call the state of Virginia’s margin as a 8-12 point win for the Democrat Ralph Northam, the race was called overall for Northam close to an hour ago. Not only did I call all three races for Democrats in the first hour, D’s look like they have a shot to take the state house, not a great chance, but a chance, which seemed unthinkable coming into the night. This was the map after the last elections. Projection: Democrats Phil Murphy, Justin Fairfax, and Mark Herring all are projected winners. Fairfax and Herring looking like five point winners, Murphy by a 15-20 point margin. Here is a look at the results in my ten potential Democratic pickups. We have called Virginia’s 13th legislative district for Danica Roem, who unseats incumbent Bob Marshall by six points. Roem is the first transgender person to hold a seat in any state house. Democrat Joyce Craig has unseated incumbent Mayor Ted Gatsas in Manchester by about six points. Northam is only up a half point statewide, but he is dominating in Northern Virginia, where Gillespie needed to be competitive, this race is over. Northam up 31 in Fairfax and 21 in Loudoun, far outperforming Clinton, who won by five statewide. Gillespie is down 19 in Loudoun, that is extremely bad news for him, he needed to be within five there to win statewide. It is still early, but if he can’t close that gap it looks like a tough path for him. First Official Call: (D) Rick Kriseman looks to have won reelection in an expensive reelection campaign by about two points. It is so, so early, but Northam is in a good spot right now. He is losing statewide, but if you remember back to 2016, Democrats always fall behind early. Northam is outperforming Clinton in Northern Virginia. Atlanta Mayor – you need to get 50% to win here, and in what is essentially a jungle primary, nobody seems to have a chance to do that, with the highest vote-getter receiving just 25% in the polls. I would guess Democrat Keisha Lance Bottoms wins the primary, but independent Mary Norwood also has a shot. Charlotte Mayor – The incumbent Democratic mayor was defeated in the primary by Vi Lyles. The only polling in the race shows Lyles with just a one point lead over Republican Kenny Smith, even though Charlotte is a heavy Democratic city. Manchester Mayor – This has increased interest because of multiple 2020 candidates campaigning. Democrat Joyce Craig has a chance to unseat Republican mayor Ted Gatsas, who has held the mayorship since 2009. Westchester Executive – Republican incumbent Robert Astorino, who ran for governor a few years ago, looks to hold on against Democrat George Latimer, in what is a heavy Democratic town, the most recent polling gives Latimer a three point lead. Here are some House of Delegates races to watch in Virginia, all are REPUBLICAN held at the moment, I note the district, area, and the Democratic nominee. Here is a look at all the polling done in the past week. and here is a look at the 2014 senatorial map, when Gillespie came within a couple points of defeating Democratic incumbent Mark Warner. Northam is going to run up the margins in Northern Virginia, Richmond, Norfolk, and college towns like Harrisonburg and Charlottesville. This race will come down to turnout, Northam is from Eastern Virginia, and in Eastern Va and Richmond, black turnout is the key to Democrats getting elected statewide, and with Justin Fairfax on the ballot at the Lt. Governor spot, Northam hopes to energize that base. The far left wing of the party however, will be less energized after Northam flipped positions on sanctuary cities, saying that he now opposed them after Gillespie hit him with attack ads referencing gangs like MS13. We will be watching 15 individual races tonight, as well as the Virginia House of Delegates in general, as Democrats attempt to break the Republican supermajority. Next Story → Alabama Senate Coverage based on Pure Statistics – A Rain Check on the Democratic Blue Wave?